The fact that Greek mythology is wonderfully suited as a theme for miniature board games may not have only been known since Mythic Battles: Pantheon. The epic stories, with their divine and heroic protagonists, have fascinated people for thousands of years. It is therefore not surprising that these have an influence not only on literature but also on the other media of our time. Lords of Hellas, however, approaches ancient history somewhat differently than MBP. Especially when it comes to the game principle. The miniature board game – initiated by Awaken Realms via Kickstarter – is located at the time of the fall of the Mycenaean Empire. Greece is sinking into chaos and only a few chosen heroes are trying to restore order. But it’s not just about the welfare of the country, because with power comes greed. And a war for the sole dominance of Greece breaks out. Attracted by this conflict, mysterious and technologically advanced beings appear to support the heroes with weapons and special powers. Each of the 1 to 4 players takes on the role of a hero from Greek mythology. You conquer lands, collect artifacts, build temples and try to gain the favor of the gods by sending priests to gain strength. Of course, there are also tasks to fulfill and, of course, monsters to defeat. So far, so familiar. But what sets the game apart is that the winner is not necessarily the one who has scored the most points because he has killed a horde of monsters. By this approach, no game resembles one another and this opens up a variety of possibilities and scenarios for the players. Lords of Hellas author Adam Kwapinski has done a really good job here. Awaken Realms once again reveals their many years of experience in miniature design (e.g. for Warhammer 40k or Cry Havoc). The wonderfully crafted monsters, monuments and the other figures make the game stand out from the masses. So that you can enjoy the miniatures for a long time, you can now find the foam tray set for the Lords of Hellas core game in our shop. Because the great amount of game material also requires more foam to accommodate the whole thing properly, the mats are significantly higher than the original game box. That’s why we recommend our Storage Box LBBG for storing and transporting the foam tray set. 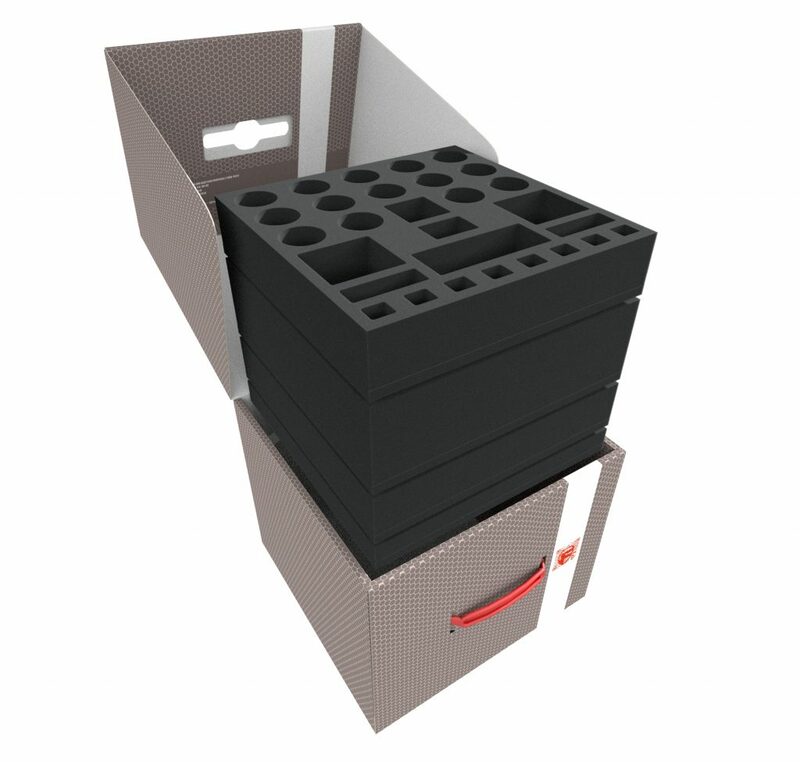 If you also own the Terrain Extension, then the 250 mm high Storage Box would be completely filled. That is why we have the practical storage box here for the entire package. Shall we also design more foam trays for additional Lords of Hellas expansions? Or do you have any comments on what we can possibly do better or what you are still missing here? Then just let us know via our Facebook page or via email to ideas@feldherr.org. Previous Post:Star Wars X-Wing 2nd Edition soon to come – We are ready for it!